*Wire over-braiding provide more abrasion resistant and EMI shielding. *Light weight. Flexible and liquid tight. *Inner core made from corrugated Nylon tube for more flexibility. 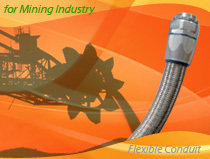 To meet the demands of the Mining & Metal industry in general, Delikon offers an extensive range of specialist conduit solutions suitable for demanding wiring applications in these sectors. The range of products protects power and data cables in mining, iron, steel and other metal industries. Ideally suited for robotic equipment. This Over Braided Polyamide Flexible Conduit is intended for applications requiring flexible motion, such as power track or cable carrier installations. 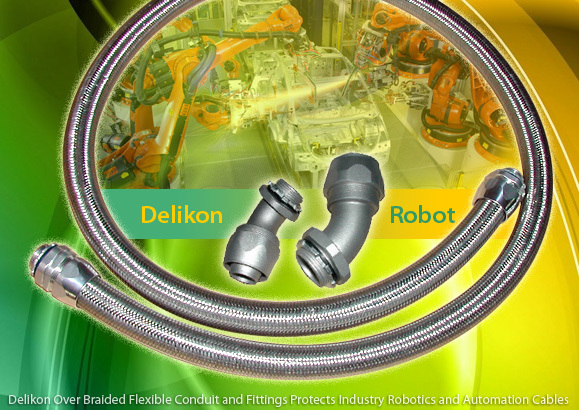 Delikon Over Braided Flexible Conduit and Fittings Protect Industry Robotics and Automation Cables. Highly resistant to abrasion, oil, and solvents. Highly flexible and high fatigue life. Delikon over braided flexible polyamide conduit is suitable for most applications combining an high flexibilitywith good mechanical and thermal performances. Ideal for static and dynamic applications, Delikon over braided flexible conduit system is the most appropriate solution for industry automation energy or signal distribution. Braided corrugated nylon conduit Flexible Corrugated Nylon Conduit with Stainless Steel Overbraid, PBF conduit is manufactured from standard weight corrugated nylon conduit, which offers superior mechanical strength as well as high radiation and chemical protection often in high temperatures. The stainless steel overbraid provides a high level of EMI screening for data cables, abrasion resistance and protects the NYLON core from mechanical damage. The conduit, at full extension, offers high tensile strength without elongation. Download the catalog page for DELIKON PBF Over Braided Polyamide Corrugated Flexible Conduit in PDF File format. 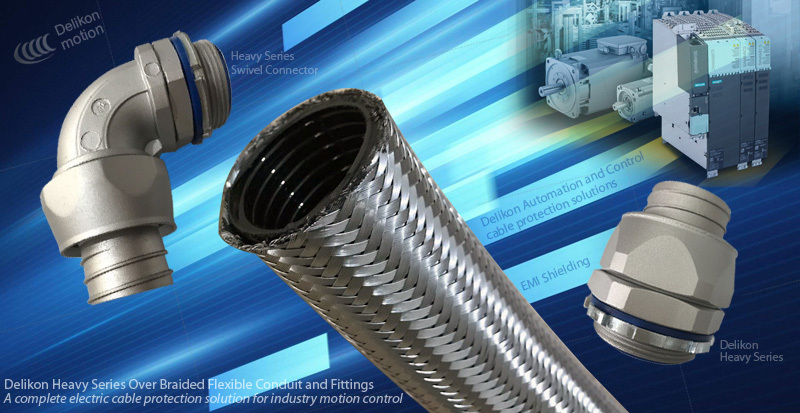 Delikon over braided flexible conduit and fittings system is designed for environments with process residues, sharp shavings, burrs, chips or sparks. Over Braided Corrugated Nylon Flexible Conduit & metal fittings (emc shielding polyamide corrugated flexible conduit) system is most suitable for industry control and robot cable protection. Delikon EMI Shielding Heavy Series Over Braided Flexible Conduit and Heavy Series Conduit Connector protect FLNG and LNG facility automation and control cables. G, PG, Metric, NPT threads Delikon Heavy Series Metal Fittings and Over Braided Polyamide Convoluted Conduit offer superior EMI protection, environmental, chemical and rodent protection. 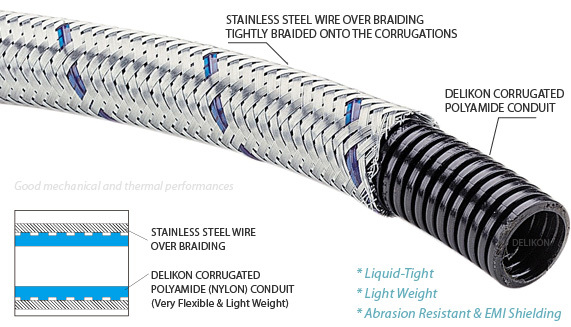 Delikon Braided Conduit wire protection is used in air, rail and transit applications. Delikon PG and ISO metric thread liquidtight connectors provide a reliable connection for liquidtight flexible metal conduit in industry applications. Delikon PG and ISO metric thread liquidtight connectors are often installed on chemical reactors and bioreactors (for example, PG13.5 thread for sensors) and various other equipment, enclosures, junction boxes. The automotive wiring harness market is driven by the rapid growth of automobile industry owing to various technologically advanced features implemented in vehicles. Automotive wiring harness with Delikon flexible conduit and fittings provides secure and reliable connections, among such gadgets. Delikon flexible conduit system protects the wiring from climatic conditions, abrasion, and dust, avoiding the high cost of replacement of wiring harness due to short circuit. Delikon EMI Shielding Over Braided Flexible Conduit and Connector provide excellent mechanical protection as well as efficient shielding to the Automotive Wires.